November 29th is World Digital Preservation Day (#WDPD2018). 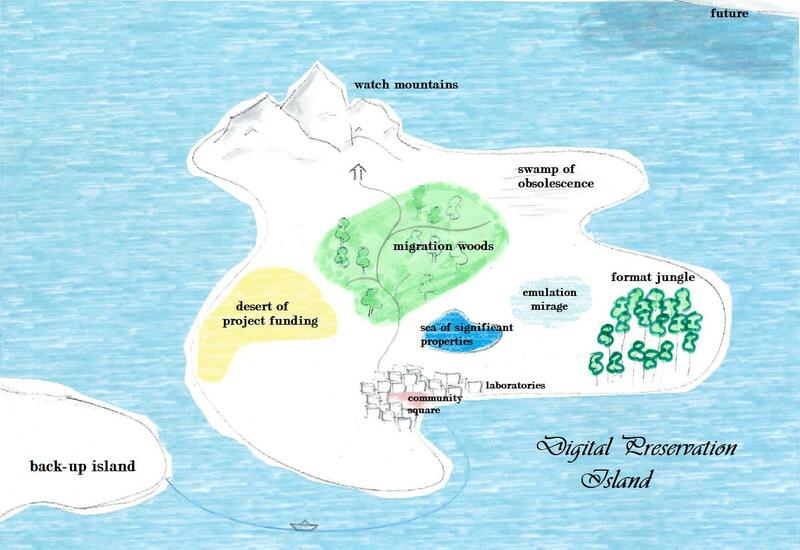 To celebrate the day, which takes place on the last Thursday every November TIB’s team digital preservation has drafted a map of and travel guide to Digital Preservation Island! Digital Preservation Island is a relatively small island measured in inhabitants, but it has a rich diversity in flora and fauna and a fascinating culture with fast changing traditions. The inhabitants are very friendly and welcoming, and like to give an impression from their daily lives. But the variety, complex interactions and affections between the people and the landscape can only be understood after some weeks on the island. People from other islands who want to settle down on preservation island are appreciated and their knowledge is highly valued. A short travel guide by Micky Lindlar, Oleg Nekhayenko and Merle Friedrich. You will most likely travel to preservation island by ferry, where you will pass by back-up island. Backup-Island is a, offshore, slighty smaller island. Although it is often mistaken to be the same island from a similar coastline, it is important to keep both islands apart. Digital Preservation is not Backup, and Backup is not Digital Preservation. Once you have entered Backup-Island you will clealy spot the differences in the landscape. Both islands are worth a visit! If you want to visit Backup-Island, there are some ferry connections. Information about the departure are available in local tourist offices. The harbor is located close to Community Square. This is a good spot to get a first impressions of what the island and its people are like. While most inhabitants of Preservation Island live spread out across the island, in small enclaves of one to to houses, there is a large meeting ground called „Community Square“, located in the center of the island. Here, preservationists gather in community knowledge centers like the „House of OPF“ or the „dpc Center“ – or just meet at pubs like „COPTR and an Ale“ or „Coat of iPRES“ to share news and discuss developments over food and drinks. One of the most famous sights of the island is the format junlge. Make sure to take plenty of time to look around and bring a camera ! It is one of the best known sights of Preservation Islands. Many come here to marvel at the bountiful flora – huge trees, many years old, which look like nothing could ever uproot them as well as small fragile greens which are just a few inches tall and still trying to get a firm foothold in the jungle. But don’t let the looks fool you – it’s a fragile ecosystem where either can vanish fast – big plants as well as small ones. Over the years, the inhabitants of preservation island have discovered different uses for the plants and many consider „their plant“ to be the perfect one. While the plants differ in benefits and ways they can be applied, they all depend on the same soil and weather conditions. As a tourist, try to embrace all of them equally. Bring the examples of interesting species of file formats from format jungle to the laboratories in order to identify their formats and validate them. First investigations have to be done by laborants from DROID and Siegfried. If they are both agree on the format then the laborants from the Jhove library should conduct further investigations regarding their validation. So far unidentified formats should be investigated in more details in order to develop their signature. The Sea of Significant Properties is halfway on the way to migration woods. If you want to enjoy the view you could take a walk along the shoreline. But it is also possible to rent a boat for some hours or a daytrip on the Sea of Significant Properties. The most astonishing fact: the Sea and the Watch Mountains derive from the same epoch in the geological timescale, and the Sea is as deep as the mountains are high! So eventhough the water is very clear, one cannot sea all the way to the ground. Two natural sights located close to the format jungle are emulation mirage and migration woods. Emulation Mirage is one of the wonders of Digital Preservation Island. Located between Format Jungle and Sea of Significant Properties, it shows a perfect mirror image of the world. The question is, whether you are ready to navigate this world! The Migration Woods are located on the road leading up to the Watch Mountains. It’s a huge area of forests – evergreens as well as deciduous trees which fall into and out of favor, depending on the time of the year. Maps for self-guided walks through the Migration Woods are available at the visitor centre located at the Watch Mountain entrance, but you may also want to exlplore the woods on your own. Who knows – maybe you will find a path so beautiful that it will once be captured on one of these visitor’s maps? The inhabitants of Preservation Island would love to hear your stories about the path you take! Just be careful not to get lost, as there are many options and sometimes the road most traveled is not necessarily the best one. As you leave migration woods, you can already see the watch mountains appear in the distance. Do not make the mistake of going too far east, or you may very well get stuck in the swamp of obsolescene. instead, head north towards the mountains. The „Swamps of Obsolescence“ is the topic of a favorite scary bedtime story among Preservation Island natives. The kind of story you tell when sitting around a campfire, with a flashlight shining into your face. As with most stories, there is some amount of truth to it: someone knows someone who knew someone who stumbled into the swamps. According to the tale, one has to be careful not to get stuck there – the secret appears to be to keep your options open and often times, the question is not whether you can get out, but at what cost. Many a traveler has lost all boots, socks and pants while getting out of the swamp. On the northern coast Digital Preservation Island has his highest mountain range called the Watch Mountains. The most striking peaks are called Community Watch, Technology Watch and Preservation Watch. The Watch Mountains have well-known hiking routes. They are maintained by a vivid local community, new paths will be prepared in the future. Hiking maps are available in the local tourist offices and online. A hike to the peaks can be exhausting, and one should bring along sufficient water and encouraging snacks. But the view from the peaks is rewarding, and on sunny days one does not only have a wonderful overview over the mountain range but also to the sea. With a little look one can spot the profile of the future islands, which are usually hidden behind dense fog. It is common to hike in groups and a lonely hiker will easily be integrated into a group. On your way back to the Community Square, you may want to take a peak at the desert of project funding – but do not travel too far into the desert! The Desert of Project Funding is a dangerous place and one should not venture there without adequate planning and guidance! Many have run out of water or food in the midst of their tour and have not returned! Those, who have managed to cross the desert usually come out stronger than before, very aware of what needs to be done to survive under the worst circumstances. You end your travels where you started – community square. The people you meet in the various houses, clubs, pubs and restraurants already seem more familiar and you may very well already feel at home a bit. 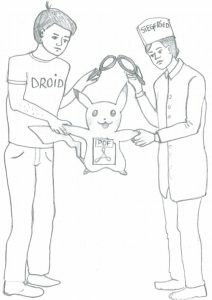 Bring interesting species of file formats along, inhabitants are very curious about the variety and keen to have examples instead of descriptions. Mark outgoing letters or postcards as „DIP“. The post ist more likely to handle marked mail carefully. Do not mix up digital preservation with back-up. Although everyone is willing to explain the difference. Just don’t. Do not try to find a suiting translation for digital preservation into German. It’s hard, even inhabitants struggle with the attempt. If you want to settle down (as an institution): bring along sufficient financial means and dedication. Settling down in Digital Preservation is not a 2-3 years project, but an ongoing process.